It’s small! I’m not going to try to kid anyone…it’s ridiculously small! The picture on the left is from the doorway facing the north wall. Directly to the left of the doorway is a small closet, and on that wall I had put my dresser. 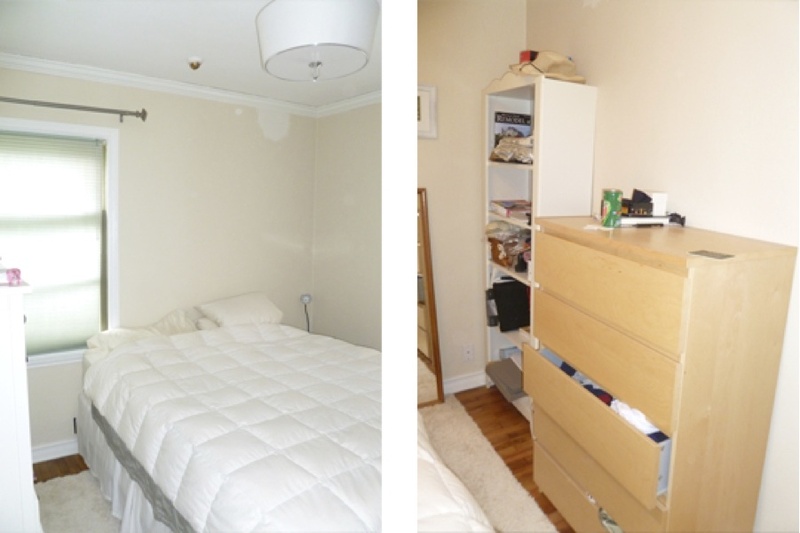 The picture on the right, the south wall, to the right of the doorway is Jesse’s dresser and my old bookshelf. When we first moved in, this was one of the last rooms I cared about. For the first time I had a whole house to live in that was all mine (ours), so all I needed this room for was sleeping. But then it started to get to me. Either it was the side stepping between the bed and dresser, or just the fact that I didn’t LOVE my bedroom, but it was time definitely time to put in the time and effort! 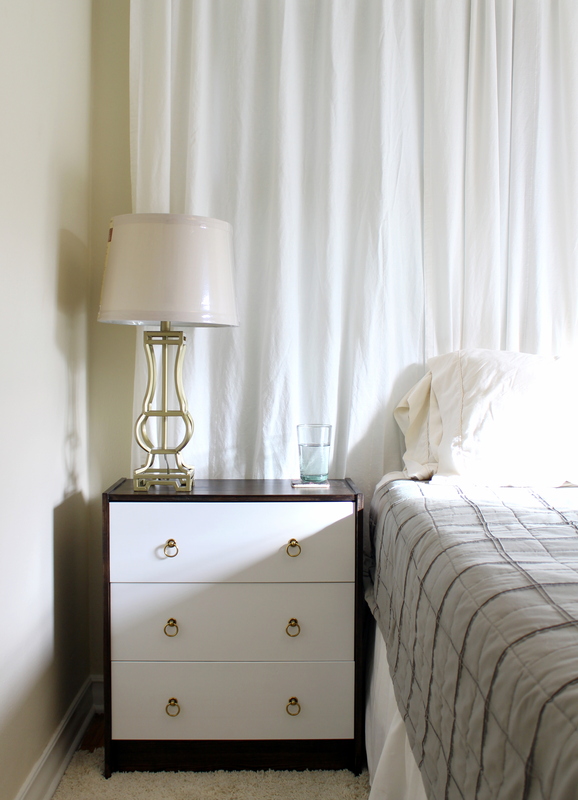 For bed side tables, I stumbled upon these from Aubrey + Lindsay’s little HOUSE BLOG who stumbled upon them from Style At Home. And as much as I would love to say that I was inspired to put my own spin on them, I just fell in love with the dark wood and white drawers…classic! 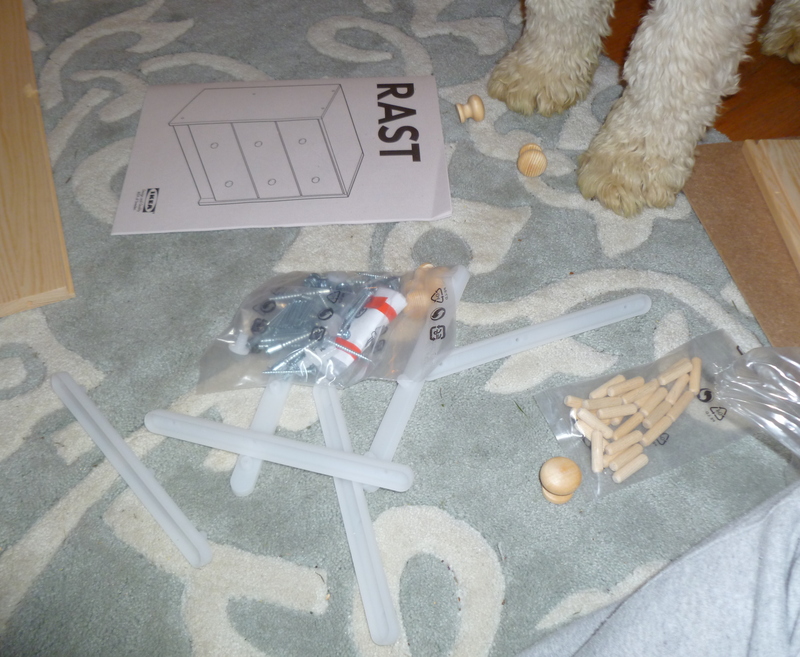 So I trucked it down to IKEA and bought 2 RAST drawer chests, and for $34.99 they were quite a steal! I had a helper…with grass stained paws! 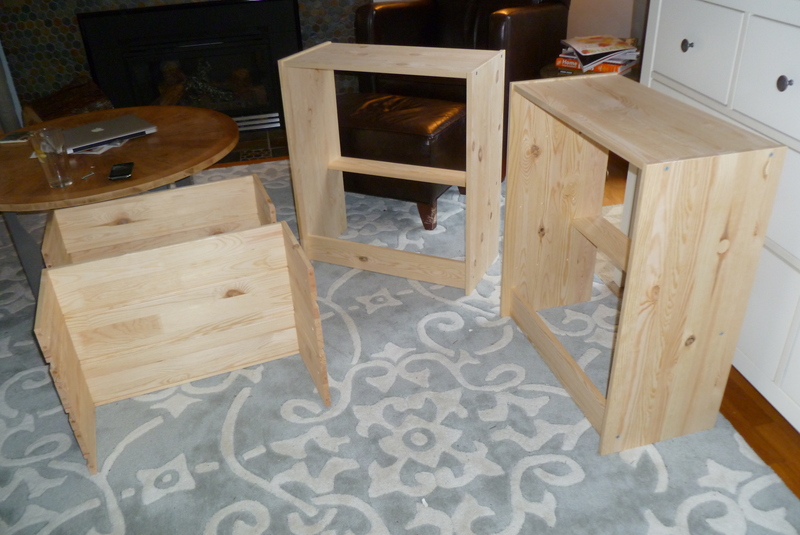 I assembled the outer frame and the drawers minus drawer front. 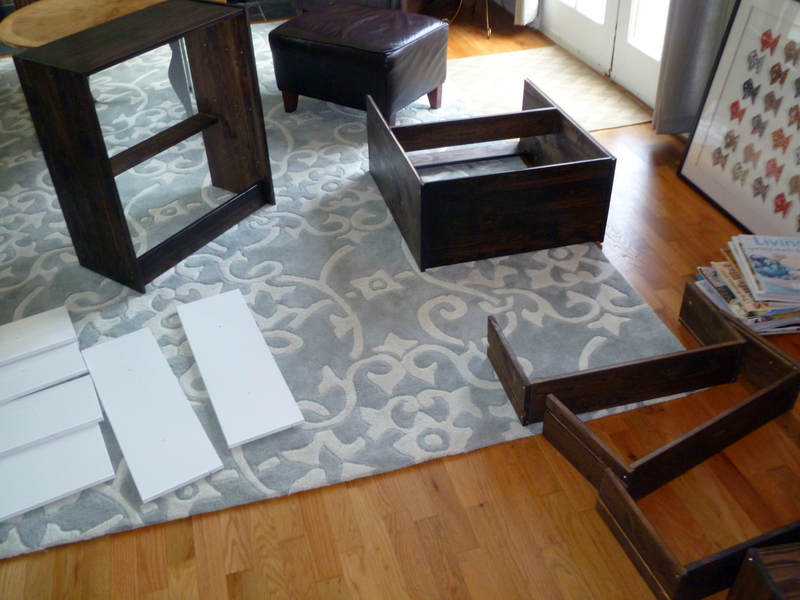 I wanted the drawers to be stained dark with white fronts, so I kept them dissembled until the very end. I stained the frame and drawers with a dark espresso stain and then did about 4 coats of Minwax polyurethane in a satin finish. 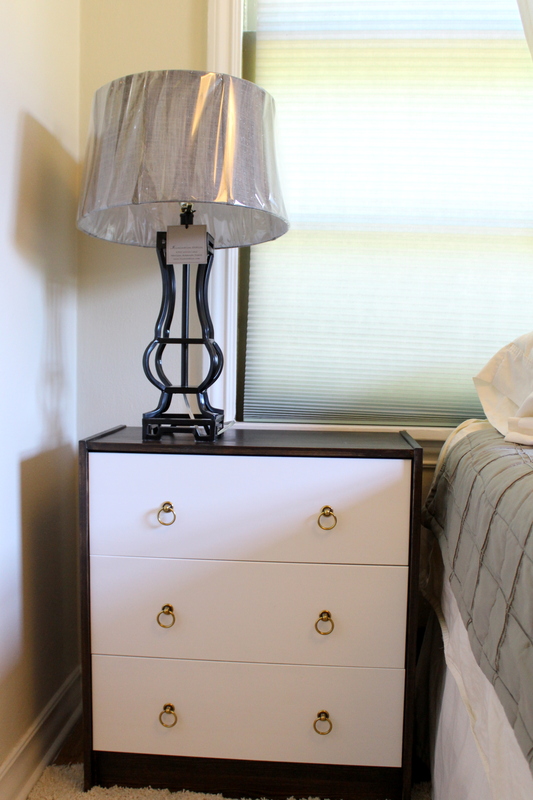 For the drawer fronts, I used white trim paint in high-gloss. 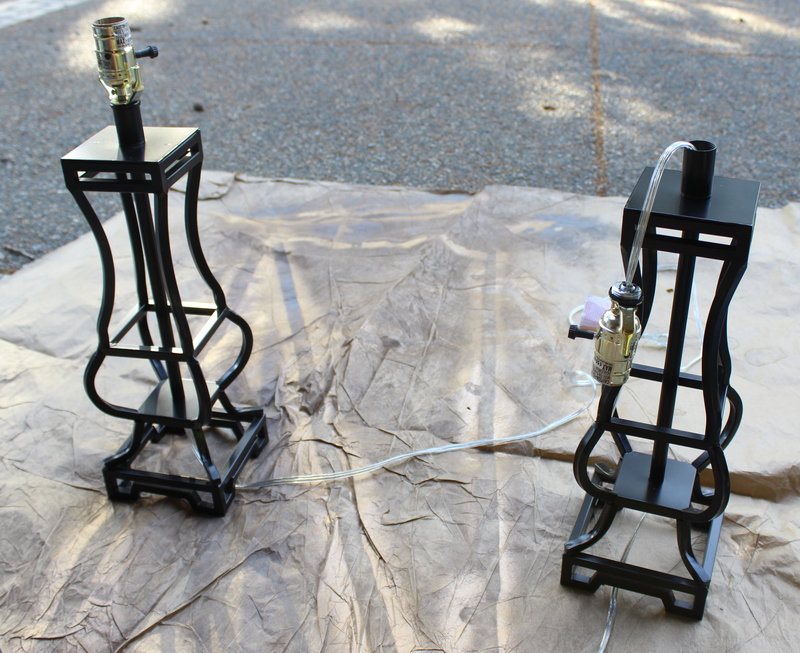 This was the most tedious process since it meant one coat per day…I try my very best to be patient! It’s the one process I hate about projects, and yet the one that makes the biggest difference. I just get too excited to wait! 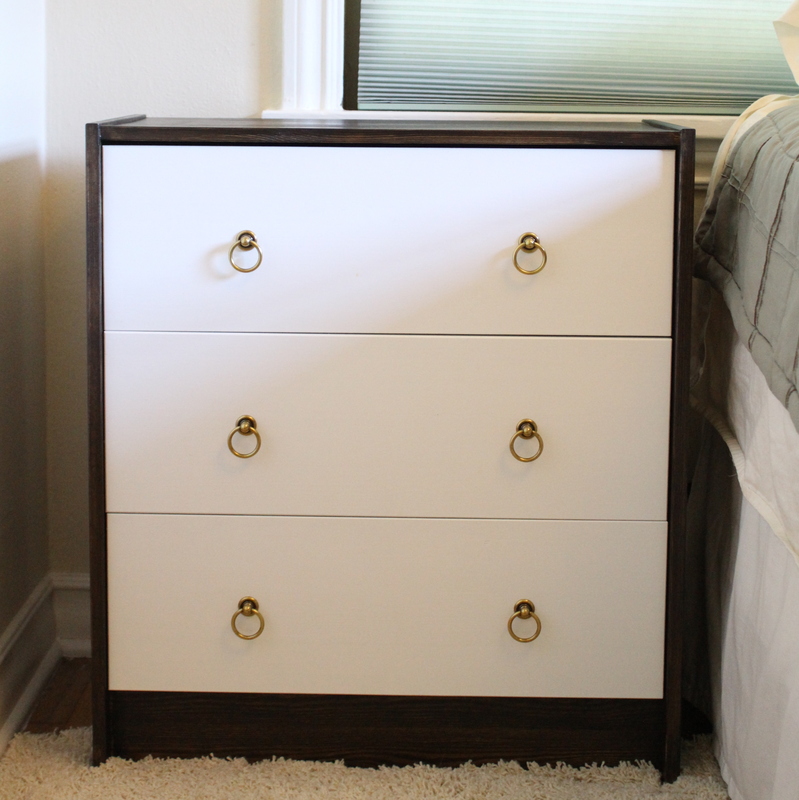 Once fully assembled, I added oil burnished bronze drawer pulls which I got at Lee Valley. Isn’t it pretty! But it needs a lamp! I never realize how hard it is to find the perfect lamp. Originally I thought I wanted the glass base lamps that could be filled with fun treasures, but against the wall they seem kind of blah. I spent a few months looking, and happened to be a TJ Maxx right after they had gotten a shipment and still had lamps in pair. Isn’t that the worst, when you find the perfect lamp, and there is only one left! I really like the base on this lamp. It has a traditional shape, but because it is just the wire frame has a sharp modern appeal to it. But the shade…not so much. It’s a little over-sized, not to mention it is grey with glitter flecks. Let’s quickly talk about the walls and the awkward window on the north wall. This wall is the only one that makes sense for the bed, but I hate how the window is off center and is kind of funny looking behind the bed, and because it doesn’t provide much light and would cost a fortune to get rid of, I decided to cover it. Plus I figured by covering it, it’s one more layer of insulation for the winter’s cold. I used the KVARTAL curtain system from IKEA, which is basically a track that I screwed into the ceiling. This way, if we do want to uncover the window, we can just slide the curtains back. 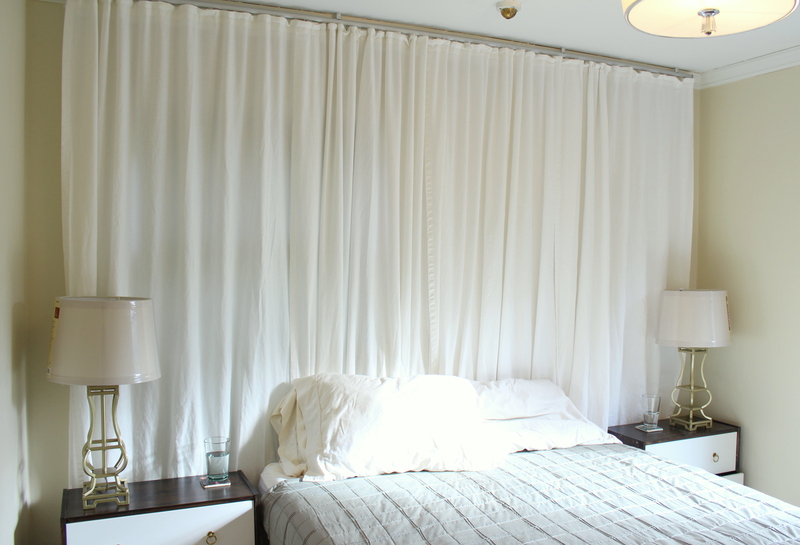 I used 4 panels of the LENDA curtains in white and sewed together. Quick tip – iron the curtains before you sew them together. I did not, and therefore had to iron a giant 6x16ft curtain…and it was a pain! But once they were up, they looked great! That leaves us with this! I found the new lamp shades at Lowes. They are kind of a greyish beige, which will tie in perfectly with the head board that hopefully will be up by Christmas. The best part is what is causing the head board delay…BEER PONG. Does that need further explanation? Probably. We have a large sheet of plywood out in the garage, and it is perfect for the head board. However, Jesse is turning 30 in November, and we are planning a joint birthday bash with another close friend of his who is also turning 30. And what does Jesse want as his 30th birthday party? Beer Pong, OBVI! So instead of buying a new piece of plywood, I will just wait and hope that is isn’t destroyed by beer. I mean, how many people can say that their head board is a reclaimed beer pong table? Not many! Let’s do a quick before and after! So this concludes my update on our bedroom! I’m pretty happy with it thus far! The curtain really softens things up and makes the room feel a lot warmer, and the best part is…I love hanging out in there now! Happy Friday – Have a great weekend!